As you might already know, Darling Harbour was the best to be when it comes to enjoying the night. 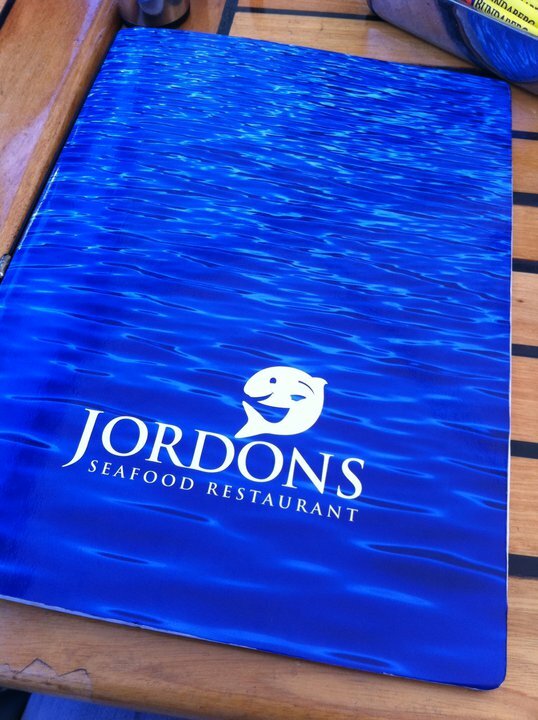 Jordon’s Seafood Restaurant is located at the heart of it and right on the corner with 270o view of the harbour. We went thru the aquatic-themed menu and we saw vast assortments of dishes. 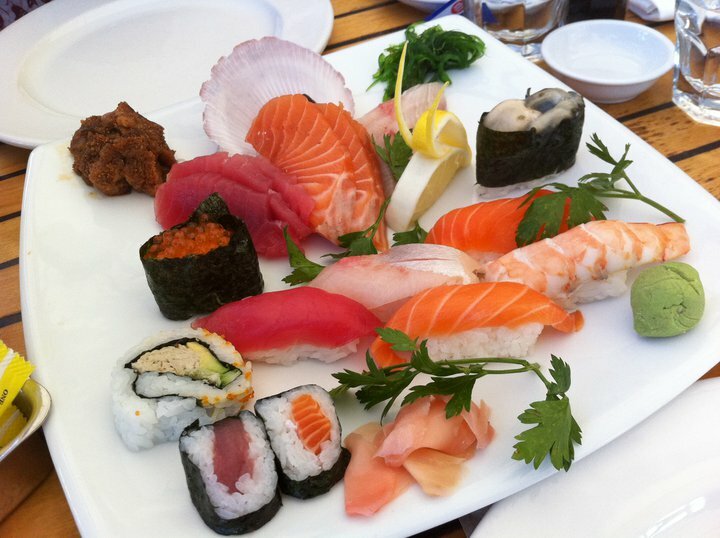 If you’re stuck there and you don’t like seafood (why do u come in the first place? ), you can still get steak or even vegetarian stuff. 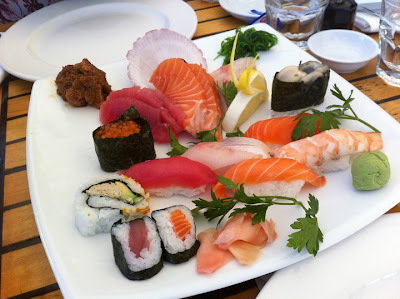 But today, the review will be all about seafood and we were interested in the items specially highlighted in a box. 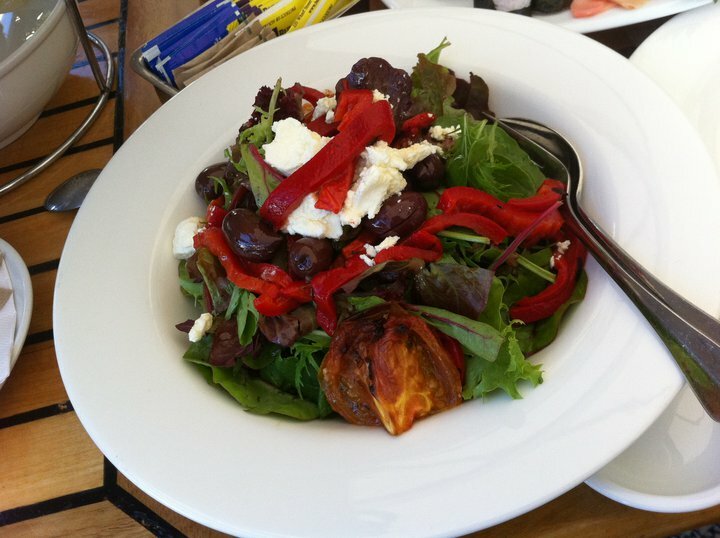 Our starter was a simple Mixed Leaf (with Persian fetta, marinated olives, roasted tomato and capsicum). It was a nice and colourful salad. For our first share plate, we ordered Sushi / Sashimi Combination (main size). When the platter arrived, we were pleased with how it was presented. On the plate there were 10 assorted sushi, 9 sashimi slices, seaweed and something yummy (that brown thing on the left corner of the plate). Upon our tasting, I discovered that the sashimi wasn’t as fresh as I’d like them to be (but don’t worry, they’re still edible). 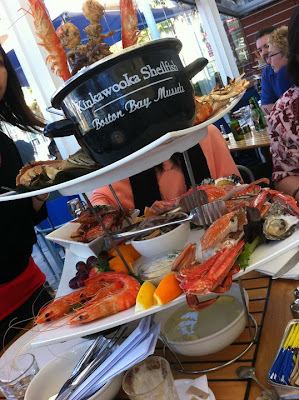 Our second platter of the day was Jordon’s Deluxe Seafood Platter (for two). 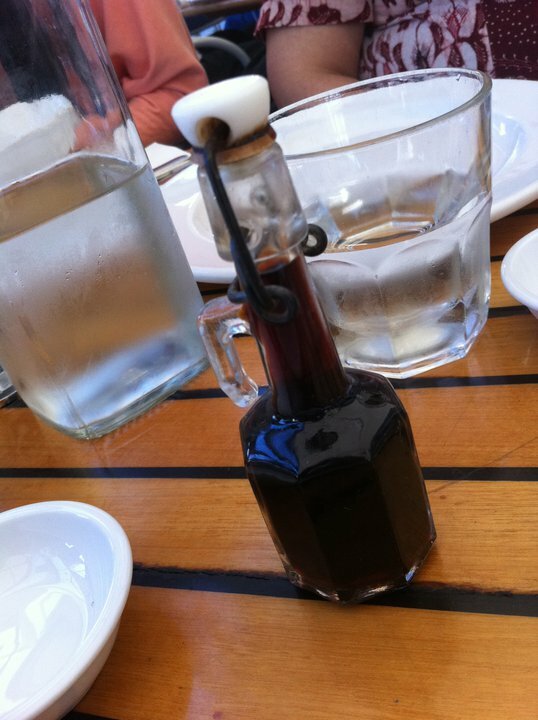 We were quite shocked with the size of the dish and thankful that we did not order the bigger one. 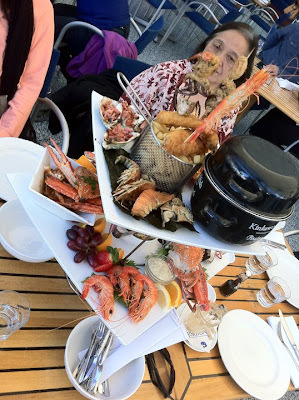 It was a massive two-tiered platter full of seafood. We were advised to finish the top tier first since they were the ‘hot’ dishes. We had a bowl of mussels, then a couple of marinated Balmain bugs laid on a big square of nori. Next to the bugs were some cooked oysters. We also got a whole lobster. In the middle of it were 4 sticks of deep fried seafood with fish and chips on the bottom. The lobster and the bugs were cooked perfectly. You could rip the meat off the shell without too much effort, but the mussels weren’t the best I’ve ever tasted. And that’s only for the first tier. For the second tier, we have an assortment of cold dishes. You wouldn’t miss a couple of Blue Swimmer crabs sitting in the corner. Then there were four fresh oysters and some chilled prawns. On the other corner, there was a bowl of Singaporean Chilli crab with some fresh fruits. Lastly there was a bowl of marinated squid and mussels with cocktail and tartare sauces. For most part, they were yummy. There was a strange note on the Singaporean Chilli Crab. I have never tried them cold and unfortunately I didn’t like it. If only the crab was freshly cooked then that tower would be great. 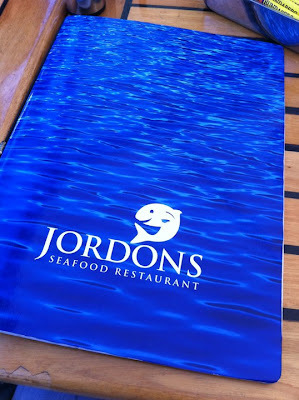 The final verdict: Jordon’s is the kind of restaurant that has much better settings and ambience than the food itself. It’s quite pricey if you compared the price per its taste, but if you add the scenery factor, then it kind of made sense. Nothing really stands out on this occasion but they were satisfying. 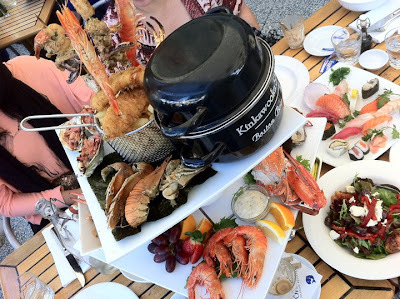 The restaurant is located in the prime location of Darling Harbour. Few restaurants beat its scenic harbour/city view. Darling Harbour is also known as one of the few places in Sydney which stores open until 9 PM for most nights. FYI, stores normally close at 5 or 6 PM on all days, but Thursday. We chose this restaurant because of the Entertainment Book. This book contains 1000s of discounts on restaurants, amusement parks, cinemas, even Coles! They are only sold at participating foundation (I bought mine at Cancer Council) for $65 – portions of it are donated for the cause. I strongly recommend you to buy this book and have a bit of adventure yourself.